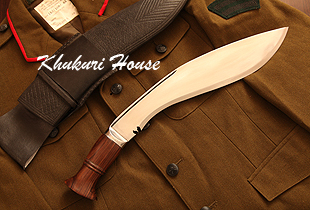 The exact replica World war I Khukuri used by Gurkha soldiers in WW I era 1905 - 1915. It was the model that was officially approved, designed, issued and numbered during the 20th century. The Great war that started in 1914, the Gurkhas were found using them in France, Belgium, Turkey, Palestine and in India too. The handle on these WWI khukuris were often short and fat. This WWI khukuri is a heavier issued knife and would need a Sturdy hand and grip to use this amazing khukuri. If you are a Khukuri Lover, collector and you don't have one in your collection, now is your chance.